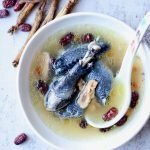 Introducing a traditional Chinese ginseng chicken soup. 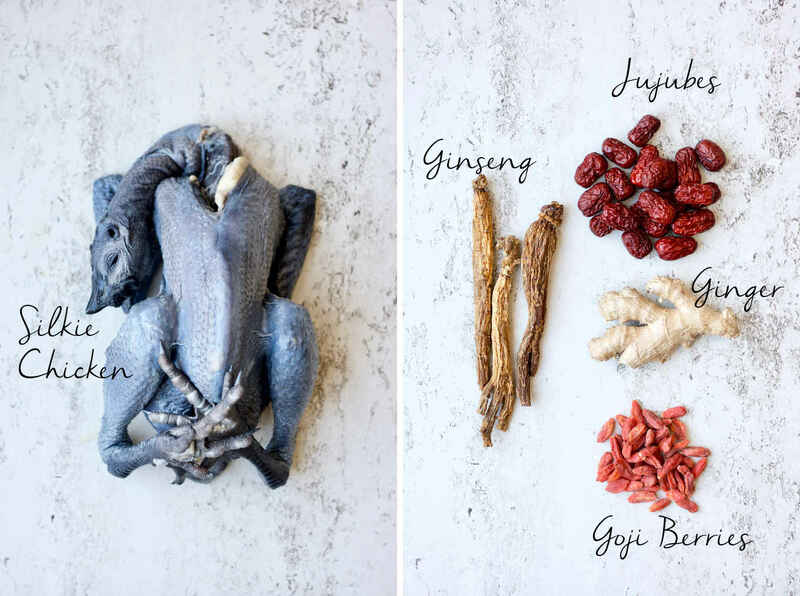 Ginseng and chicken are a beautiful marriage of healing benefits and flavour. 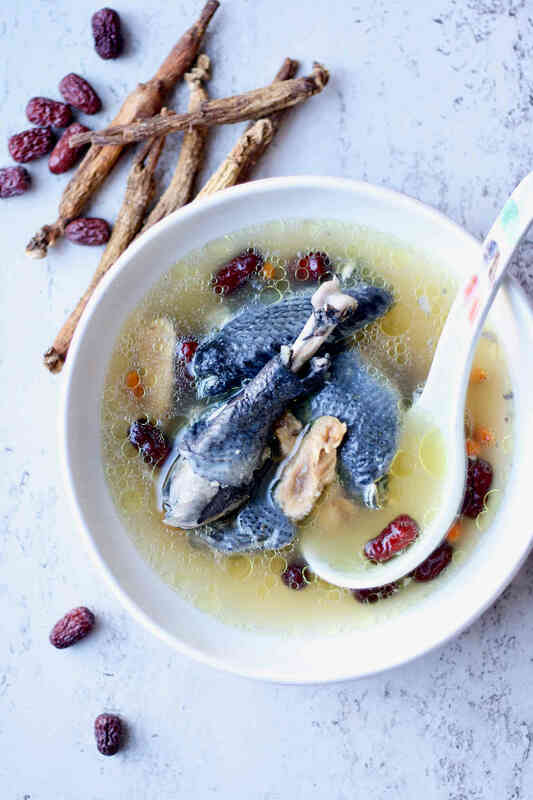 Chinese ginseng chicken soup incorporates some unique ingredients, setting the soup apart from versions of other oriental culture. 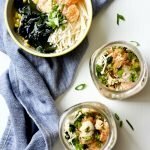 This Chinese ginseng chicken soup is really easy to make and deeply delicious. Let’s take a look at the ingredients of this nourishing soup. 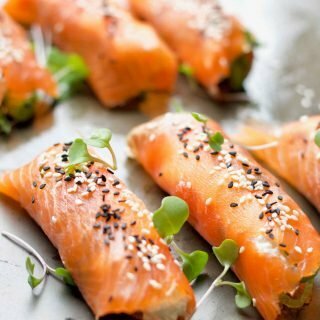 As food and medicine were evolved from the same origin in ancient China, food therapy is an important part of Traditional Chinese Medicine. 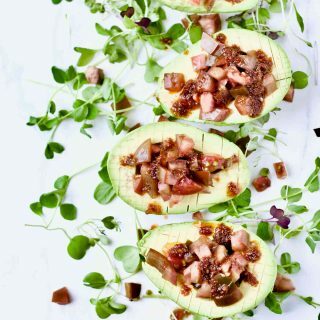 In a food remedy, not only each ingredient should be of the highest quality, ingredients should also work synergetically together. 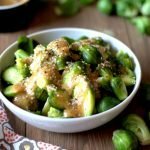 All the ingredients in this recipe have similar properties that are nourishing, strengthening, and warming. I used a very special variety of chicken in this recipe, the silkie chicken. Silkie chicken, also called black chicken, contain high level of black pigments in its skin, flesh and bones. The silkie variety has more minerals, vitamins and anti-oxidants, than the regular chicken. Next time you see silkie chicken in the grocery store, be sure to pick one up! What if I can’t find a silkie chicken? Just use a regular white chicken instead. The soup will still be authentic with a regular chicken. But using a silkie, aside from adding the extra yumminess and healing power, will also make you the coolest chef in the house. Is it important to use a free-run chicken? Yes, in my opinion free-run chicken not only is healthier, tastes better too, whether you use a silkie or not. I had been a patient of Traditional Chinese Medicine for many years, and I learned that there is so much I will never know about ginseng. Many people in the western culture think that ginseng is one specific plant. In reality, the name “ginseng” is a very general term, as if saying “mushroom” or “tea”. There are different varieties of ginseng grown in different regions of the world, with varying nutritional value and medicinal properties. In addition, ginseng can be fresh, or processed with different methods and aged, further changing the medicinal properties of the ginseng. If you are into food therapy, you certainly shouldn’t be using all ginseng interchangeably for the purpose of tuning our health. For example, the American ginseng variety is known for its cooling property, while the Asian (Japanese, Korean, Chinese) ginseng varieties have the opposite warming and stimulating effects. Some dry aged ginseng are processed with other ingredients that provide additional benefits but may also act too aggressive for certain people. It’s best to get assessed by a TCM practitioner or get recommendation from an experienced herbalist on what kind of ginseng is most suitable for the individual. The kind of ginseng I use is recommended to me by my TCM herbalist. This variety is called “Shi Zhu Shen”, as it comes from the Shi Zhu area of China. It was also recommended to me to only take in the cold winter time, during the snow season. If you have access to ginseng, be mindful that the variety you have may carry different properties than mine, and the effects on you may be unique due to your state of health and even the season you are in. If you use American ginseng, they are more suitable for consumption year round. After ginseng is cooked in the soup, the whole root can be eaten. Good quality ginseng are quite expensive, therefore not something to be wasteful of and discarded. I have been told and you may find this interesting too that the head of the ginseng root is more nutritious than the tail end. Jujube fruit (or red date) is another ingredient of the super food status in Chinese cuisine and traditional medicine. Jujubes are rich in iron and minerals, therefore frequently given to women to replenish blood. Additionally, jujube fruit has a big range of health benefits, making it a popular ingredient in many recipes supporting good health for everyone. Jujubes are naturally sweet, super versatile to be used in sweet and savory soups, desserts, porridges and teas. The kind of jujubes we stock in the pantry are dehydrated. It’s very rare to find fresh jujubes, besides the dried ones last a really long time. Because jujubes are usually cooked in soups and added into teas, the dried jujubes will soak up the liquid and rehydrate. Goji berry should be no stranger to the health-minded folks. 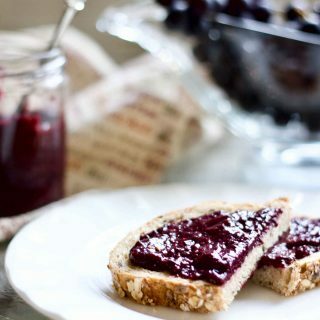 In North America, I have seen this super food berry made into juice, tossed in the cereal bowl, pressed into granola bars, baked into breads. Traditionally, goji berries are most often used in healing soups and teas. Goji berries are great for general immune support, and known for strengthening liver and kidney functions and protecting eyesight. Similar to jujubes, goji berries are also bought and stored in dry form. Rehydrating goji berries is very quick and easy. Goji berries don’t need to be cooked, as consumed in teas. When used in soups, goji berries shouldn’t need to be cooked for a long time either. You will hardly find a Chinese soup without ginger. Ginger has a warming nature, aids digestion, fights infection and being anti-inflammatory. Ginger pairs well with jujubes and goji berry – all 3 are classic ingredients in healing soups. The value of ginseng and Silkie chicken are evident in Chinese medicine, as ginseng and silkie chicken soup is often served to the very special people at special occasions, such as the elderly with weakened health, a pregnant woman, a postpartum mother serving her confinement, a hard-working student studying for a big exam, or a patient recovering from a surgery. 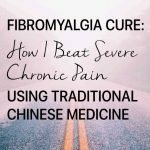 One of the things I have come to appreciate the most about Traditional Chinese medicine is the recognition of how individuals are different. Each remedy, no matter how nutritious, isn’t suitable for every person and situation. Remember that I am using Asian ginseng in this ginseng chicken soup? This remedy is not suitable for those who have too much energy, fire and heat, of high blood pressure, or with liver and gallbladder diseases. You also shouldn’t be eating ginseng chicken soup during a flu, fever or infection. Watch for signs that ginseng chicken soup may not agree with you, such as dry mouth and throat, nose bleed, headaches and insomnia. The effect of the remedy may be too stimulating and aggressive, at such times we need to back off or reduce the consumption. 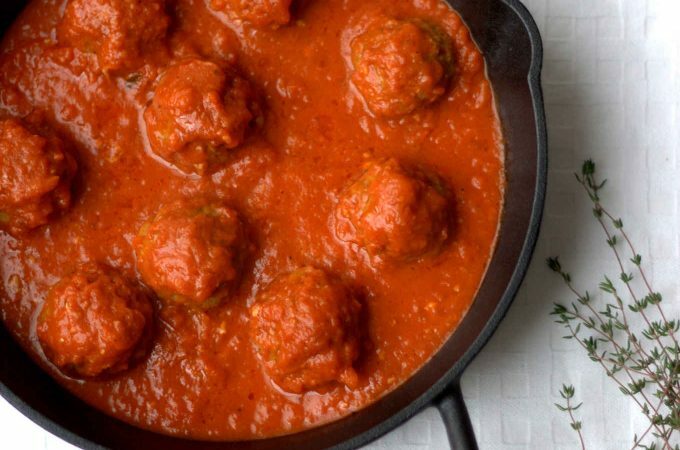 In order to achieve the most delicious and beautiful soup, here are a few important steps I take to prepare the chicken. Pre-cut the whole chicken into small pieces. 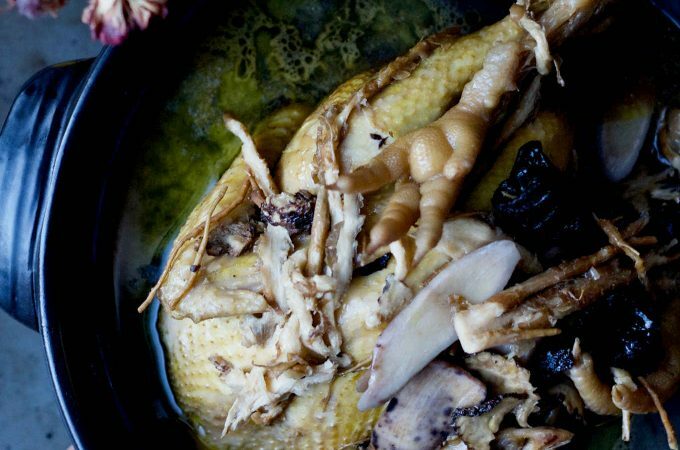 You can certainly make broth with a whole chicken, and then cut the chicken after cooking. I have made my chicken broth both ways, and I tend to prefer cutting the chicken into manageable size before cooking for a few reasons. 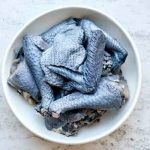 One is that it’s not fun to touch boiling hot chicken after it’s cooked in a soup; another is that after cooking, you will likely rip the chicken apart instead of getting clean-cut pieces out of it; and most importantly, you can get rid of more impurity from the pre-cut chicken during the first boil. The trick to cut up a whole chicken is to enter the knife between bones where they naturally separate. 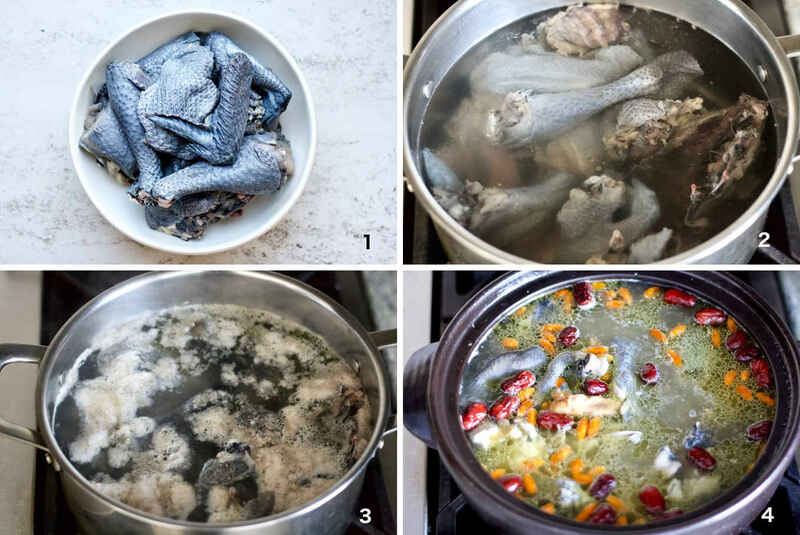 To remove impurity from the chicken, you want to submerge the chicken in cold water first, and then bring the pot of water and chicken together to a boil. 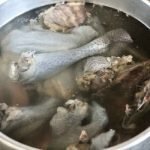 If the water is boiled first before adding chicken into the boiling water, the heat will seal up the surface of the chicken meat preventing the blood and impurity from being released. Bringing the chicken and water to a boil together will get more impurity out of the chicken. You will see a layer of thick foam and scum floating on top of the water. Some people skim the foam, but many people discard this water altogether. I always discard this batch of water, rinse any scum that may be stuck on to the chicken and scrub the scum stuck on the pot if re-using the same pot. Refill the soup pot with clean water, chicken and other ingredients according to the recipe. This will ensure the most delicious, clear and beautiful broth. Ginseng and chicken are a beautiful marriage of healing benefits and flavour. Chinese ginseng chicken soup incorporates some unique ingredients, setting the soup apart from versions of other oriental culture. 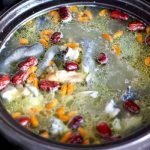 This Chinese ginseng chicken soup is really easy to make and deeply delicious. Cut the whole chicken into small pieces by separating between the bones. Submerge the chicken in a pot of cold water, then bring the pot to a boil. Heating up the water and chicken together will bring out the most impurity. Let the water boil for a couple minutes. There should be foam and scum floating on the surface of the water. Turn off heat. Discard this batch of water. Rinse the chicken pieces to remove any scum that may be stuck on the chicken. 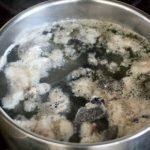 If re-using the same pot to make soup, rinse the pot to remove any stuck-on scum as well. Fill a clean soup pot (I use a traditional clay pot) with 10 cups of clean water. Add the clean chicken pieces, sliced ginger, and 2 medium ginseng roots. Bring the soup pot to a boil and simmer with lid on for 1 hour. Remove the ginseng roots from the soup, they should be softened now. Cut the ginseng roots into slices, then add them back into the soup pot. Add 20 clean jujubes (red dates), then simmer for another 30 minutes. Add 1/2 cup of rice cooking wine, 2 tbsp of goji berries into the soup pot. Season with sea salt to taste, about 1 tsp. The soup shouldn't taste salty, and it should be slightly sweet. Simmer for another 15 minutes, remove from heat. See "ginseng chicken soup ingredient" section above for more details on ingredients. See "how to prepare the chicken" section above for the rational behind the method I use to remove impurity of the chicken. I love how much I learn from your blog posts! 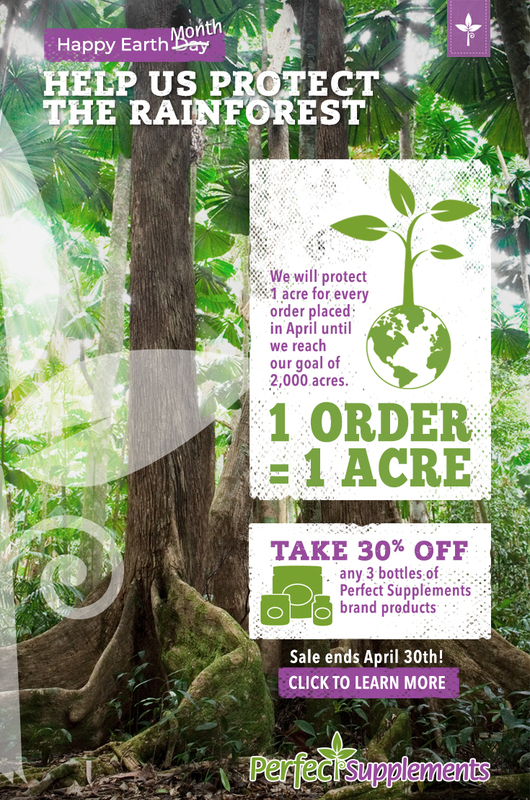 Off to find these ingredients… Thanks for sharing! What a nourishing looking soup Yang! I have never heard of silkie chicken so I am excited to try this. I have used ginseng a lot in liquid herbal formulas but have never tried it in a soup before. This is the first time I have come across Silkie Chicken. Never heard of it and never seen it, but if you say, it is much healthier, I must for sure try and find it. 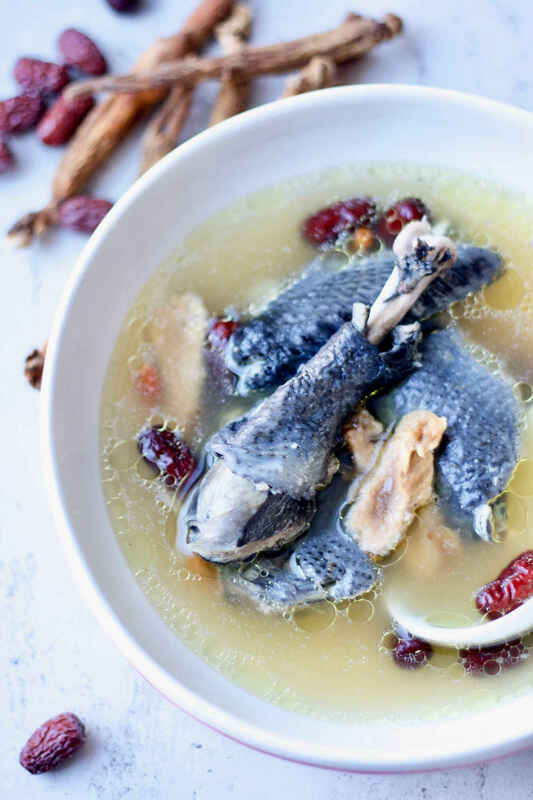 I am going to need to hunt down the ingredients to make this delicious looking ginseng chicken soup! I always skim the foam from the top of my chicken broth but never thought to just discard the liquid completely. It makes so much sense… thank you! 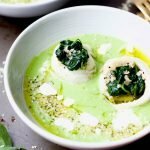 This is just absolutely gorgeous – I have a chicken in my fridge right now and this comforting soup is definitely inspiring me! It is still so cold here – we need this! I remember eating this chicken soup when I grew up. The broth was so sweet, tasty, and flavorful. Definitely making this again since it’s still cold. Wow. There are SO many helpful bits of information. Never thought you could put goji berries in a soup. Never even heard of silkie chicken and now I have to try it so I can be the coolest chef in the house. 😉 Can’t wait to make this! This post is so informative! 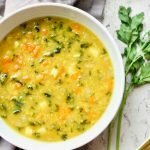 Very healing soup! So pretty! I’ve never seen that chicken available around here. I’ve heard of it, but didn’t realize it was more nutritious than regular. Yum, all the amazing nutrients! I NEED to find that silkie chicken, it’s seriously so cool! 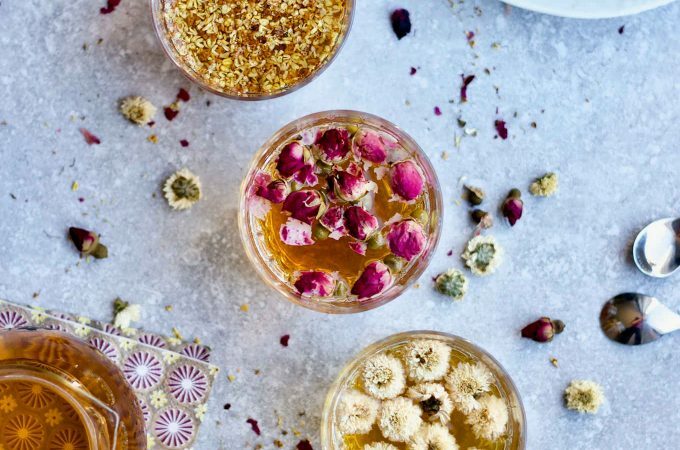 I was so curious to try all the medicinal ingredients, and I loved it! I could not find a Silkie chicken, so used regular! You have so many insightful tips that I appreciate. Thanks for that lovely attention to detail and your emphasis about each of us being individuals re our nutritional needs. Thanks, too, for sharing about silkie chickens, which I was excited to learn about for the first time! 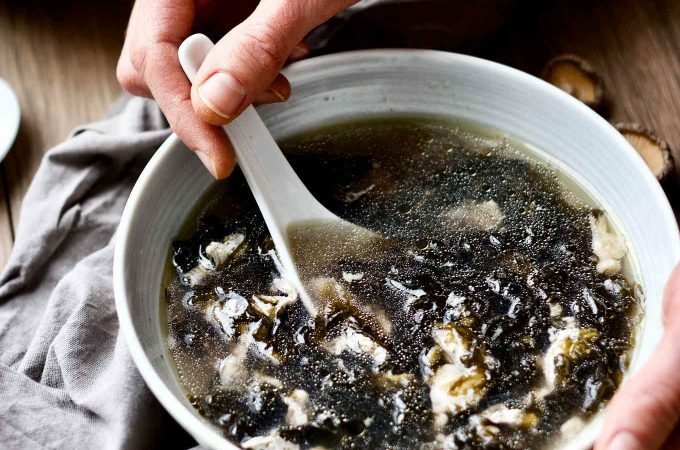 I love everything about this soup – the healing qualities and the warm, nourishing taste.